This morning after dropping Rowan off at preschool, I went kayaking for a couple of hours. I went out towards Middle Channel, over to the lighthouse and then approached Beardslee Island before heading back to town. Rowan and I went to Swan Lake after I picked her up from preschool. Weather: Winds were calm and temperatures got into the 50s. There was a thin high overcast for much of the day, but without any wind, even the dimmed sun felt warm. Heavier overcast started to come in later this afternoon, though a break near the horizon this evening made for a colorful sunset. Later in the evening it started raining. Birds: I was hoping to see Fork-tailed Storm-petrels today, but had little luck in that regard. I may have seen one when I was headed back in. It flew something like a storm-petrel, but crossed some distance in front of me and I lost it before it really ever settled down. I saw 10 Common Loons not far past the Lighthouse. There were also at least 40-50 cormorants, with the large majority of them Pelagic Cormorants. Mostly they were sunning themselves on the rocks, until they decided they did not care much for me and my kayak and flew away. At Sage Rock there were quite a few Harlequin Ducks, and a small flock of Black Turnstones flew in as I was getting back to shorer. I heard a Northern Flicker around the neighborhood this morning. About the same time as Rowan and I arrived at Swan Lake, at least 50 crows flew in as well. They seemed to mostly be hanging out together, foraging on the grass, with some taking baths at the edge of the lake. After some time, they all flew off across the lake together in a couple of flocks. There has been a Belted Kingfisher at the lake recently. It seems to favor a perch across the lake from the penninsula. Today I think I saw it being chased by a crow. It looked as if the crow was chasing it and finally it plopped into the water as kingfishers sometimes do. After a moment, it popped back out again and flew off to its favored perch (with another plop or two along the way). It may have just been coincidental alignment, rather than the crow actually chasing the kingfisher, since both were so far away, I’m not positive they were actually as close together as they looked. There were more scaups on the lake today. At least 7-10 of them. I’m still trying to puzzle out whether they are Greater or Lesser Scaups. The ones I have had the best look at are not obviously one or the other to me. I finally got a good enough look at Ring-necked Ducks to be sure there were some there (after thinking I saw at least one last week, I never got a good enough look again to feel confident in that). 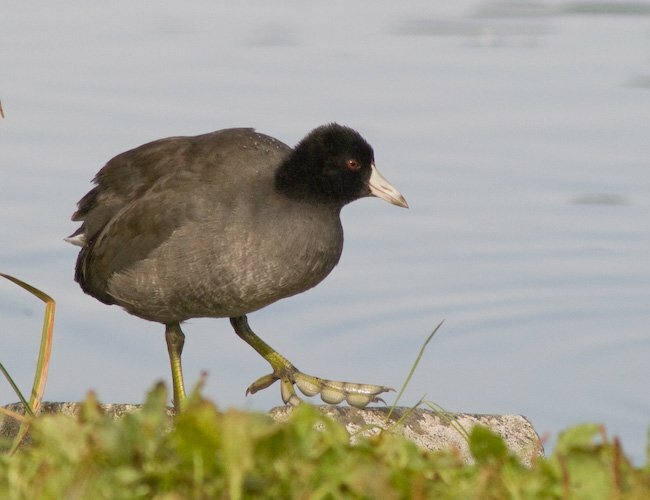 Another new arrival at the lake was an American Coot, the first I’ve seen this fall. Holdovers from previous days included three American Wigeons and a Cackling Goose. I also heard a Northern Flicker somewhere in the area while I was at the lake. That’s not too unusual, I’ve found. This evening at sunset I saw a Cackling or Canada Goose in the water off Sage Beach. It was by itself on the water, so I had a difficult time judging how large it was. Other Notes: There was an active dragonfly at Swan Lake today. I have not noticed one the last few times I have been there. I suspect the warmer temperatures today had something to do with its activity. This entry was posted in daily, photo and tagged American Coot, american wigeon, Belted Kingfisher, black turnstone, Cackling Goose, Common Loon, Crow, Fork-tailed Storm-petrel, Harlequin Duck, kayaking, Northern Flicker, Ring-necked Duck, Scaup, Swan Lake. Bookmark the permalink.